I’m not much of a beer drinker. That’s not to say I’m a teetotaler. Far from it. I’m a huge fan of dry red wines, especially Cabs and Malbecs, and more than one brand of bourbon can be found in our hangar. Hey, half the fun of flying is hangin’ in the hangar afterward; and part and parcel of that is adult beverages. Booze and flying have gone hand-in-glove together since the days of the open cockpit biplanes. Of course, given the reliability of airplanes in those days, you really needed a drink when you got back on terra firma. Planes are safer and better today, but far be it from me to shirk aeronautical tradition. Anyway, as I was saying, although I work hard at honoring the flying tradition of the post-flight drink, beer isn’t my weapon of choice. It just doesn’t do much for me. Sure, maybe once a year with a Mexican combo plate, an icy cold cerveza hits the spot, and in cases like those—just like with my wine and spirits—I tend to go for the heavy stuff. A dark beer, the color of coffee, please. Poor Tess hasn’t flow much in the last year and a half, and with our recent crunch that bent her like a beer can just forward of her wings, I suspect my logbook is gonna remain bare for months to come. But her best adventure of late was the flight up to Spanish Fork, Utah for the Mt. Timpanogos Air Race, part of the Aeroplanes, Trains, and Automobiles event, the only race of the shockingly short, weather-battered Sport Air Racing League season that we made it to this year. It was a long flight, something like six hundred miles, complete with two fuel stops. Plus crossing the Rocky Mountains. In late August. Don’t get me wrong. It was a lovely flight, but flying is actually hard work, and this route is challenging for a low-powered plane. Once on the ground, the day was getting warm, the fuel pump was being fussy, we had to prep Tess for the race the next day, and there’s an appalling lack of shade in which to do all of this on the airport ramp. The party was in the Patey hangar, a magnificent two-story structure in the heart of the airport. 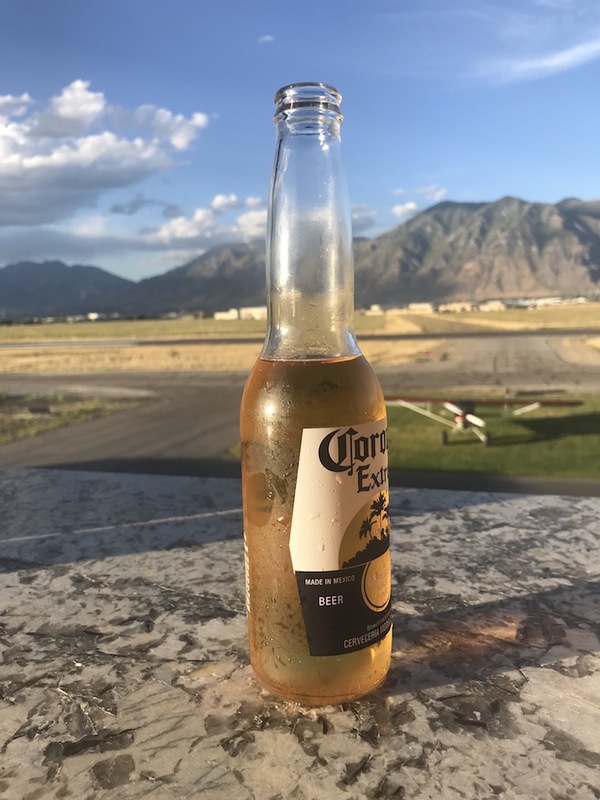 It features an upstairs inside-outside deck with a magnificent view of the ramp, taxiways, and the arrival end of Runway 30, as well as a stunning vista of the mountains of the Wasatch Range that tower above Spanish Fork to the east. On arrival at the party, I subtly stuck my nose into each of the various coolers scattered about to find soda, water, more soda, and more water. My inner barnstormer sighed and resigned himself to a dry evening with good friends, good surroundings, and a good view. Still, I was having some trouble winding down, and was pining for a cool glass of iced red wine or a Jack and diet Coke on the rocks, when I heard a baritone male voice boom out: “Beer.” Followed by the resounding thud of a heavy cooler being dropped on the floor. A beer will do just fine, thank you. Inside the cooler, nestled in layers of ice, were cans of Bud, bottles of Guinness, and golden, glowing Corona Extras. Normally, I would have gone for the Guinness, but for some reason the Corona was whispering to me. I pulled one free from the ice and began the hunt for a bottle opener, the one thing the otherwise impressively equipped Patey hangar didn’t seem to have. I can’t remember where I found one, it might have been part of a kitchen can opener, or it might have been a fellow racer’s Swiss Army knife, but the cap finally free of the bottle, I sat on the outside party deck and took a deep slug of the cold amber liquid. It was light on the palate, clean, refreshing—beating back the heat with its south of the border magic. I sat on the deck, surrounded by people, yet in a momentary solitary bubble taking in my surroundings. The roar of airplane engines. The magnificent blue sky of the Rockies. The dying light of day. The comradeship of fellow pilots. 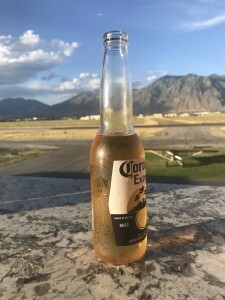 And the coldest Corona ever, condensation fogging the bottle. Yeah. It was the best beer ever.